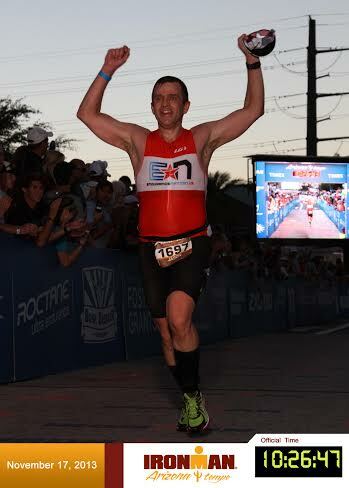 Arizona 2013 Race Report: Jason Brandt, 10:26, First Timer! This was my first Ironman® and my journey began 2 years ago by taking adult swim lessons offered by BWAQ Masters and started swimming with masters in Dec 2011. I had never really been a swimmer and after swimming a 2 mile open water swim in Aug 2012 concluded that I was ready to try my first Ironman. Also in 2012 did some sprints and Olympic races and really enjoyed them so much better than the super sprint I did in 2008 promising myself never to do another triathlon until I learned to swim. Volunteered as a finish line catcher at Arizona 2012 to secure my sign up spot and also bottle the enthusiasm and excitement that I witnessed during my 6-Midnight shift. 2013 only did three events, Alacatraz swim, Boise 70.3® and IMAZ. Wanted to put it all into Arizona knowing it might be my only IM and didn’t want to have any regrets of if I had trained properly or raced hard enough. Joined EN in July thru the referral of my great friend Robert Donnell. Followed Coach Rich’s Season Plan and the IM Intermediate training plan to a tee. Got a bike power meter about 3 weeks before race just long enough to do one FTP test and my final race rehearsal using it. Weather/Conditions/Notes. 57 degrees air temperature, 63 degree water temperature. Mass deep water swim start of 2653 age groupers single loop. Swim starts into the sun. Goal was 1:15 +/- 4 minutes. Knew I was capable of a 1:08 but I budgeted a fudge factor given that at multiple mass start races prior that I experienced anxiety in which I had to just stop swimming, calm myself down and avoid the masses. 1:15 was double my HIM swim 6 months earlier. T1: Kissed my wife and waved to the kids as I ran to retrieve my transition bag. Sat outside tent, helmet, glasses, socks, shoes, thru the tent and the sunscreen volunteers and then off to get my bike. 4:17. Not bad perhaps could have shaved another 70 seconds by skipping socks, don’t think I really need them. 3 Loop course, Flat, very gradual hill prior to each turn around. Winds increase as day goes on. Conditions were great and winds less than expected, didn’t really notice any until lap 3. Goal was 5:48 +-:21 min. Predicting time was the biggest variable for me as I had just switched to riding with power 3-4 weeks prior, only had 1 FTP testing and 1 race rehearsal with power. Also my FTP route has turns, stoplights, etc. (need to find a better place to test) versus this course which would be wide open, smooth, fast, and flat. Narrative: Coach Rich was right, 90% of bikers doing the exact opposite of me. Was getting passed by lots of riders, folks out of the saddle powering up bee line, coasting back down the bee line, getting out of Aero. HR slowed down from swim 4 min into bike. Saw fellow EN athlete Rian Bogle early on and wished each other well and to follow the 4 keys. I fueled well, stayed aero, rode steady and concentrated on getting 3S power in range and keeping average/normalized close to one another. Seeing my wife and kids several times and all the energy of the crowds and race signs kept me positive and happy the whole way. Watch lapped every 18.67miles (1/6 of course) and monitored 3S Power, HR, Cadence, LAP NP, Lap Power. Fellow EN Robert Donnell was giving me time, ranking and speed each time I saw him cheering athletes on. Felt good on the bike, was passing a lot of folks by second and third laps. Exited bike feeling great. T2: Bike dismount came quicker than I thought and dismounted with my shoes (wasn’t my plan). Ran to get bag and sat outside tent. Helmet off, shoes/socks off replaced by compression socks and Asics GT2000 and my ziplock bag. Volunteer told me I had to have number on not in bag so that took me a few seconds to fetch out and in the rush tore the number from the race belt thus requiring a pin from a volunteer. T2 Time 3:07 probably should have been closer to 2:00 if I had done shoes and race belt correctly. Volunteers putting on sunscreen felt like a full body massage albeit very brief. 2 loop flat course with lots of spectators and energy. Must have been mid 70s, no wind. Goal: 3:58:00 achieved thru 6 miles of 9:28 and remainder at 8:58 without slowing down. Plan to run each mile 15 seconds or so faster to allow for 10-30 seconds of walking at each aid station to down the fluids and treat my body to a very short walk. That walk was something I would look forward to as the miles wore on. Finish: I had the finish chute all to myself. Stopped for a kiss to family in the stands and then ran onto the finish. To hear Mike Reilly say those words “You are an Ironman” and then be “caught” at the end by my good friend Scott MacDowell who presented me medal. Made for a great end to a wonderful race. Stared at the clock in disbelief as I never in my wildest imaginations would have thought I would have raced a 10:26:47. Ate the CD breakfast at 3:30AM. My goal was to use all on course nutrition offerings plus a few gels in case I missed a station + salt tabs. I drank 3 bottles of perform in first hour on bike and then at least 2 per hour after that, gel every 45 minutes. On the run had 1 sometimes 2 3-4 oz servings alternating between perform and coke and a gel every ~30 minutes. Never refused ice, sponges or water over the head. Saw my good friend Bill at the Dr Seuss aid station around mile 18. 3 salt tabs starting bike loop 3 and 2 on start of run and again for safe measure when I felt a calf tingle at around mile 22. Following race: Took in post race massage but wasn’t hungry. In fact ate a salad to get some fiber after a day of so much liquid sugar. I felt great this week except for some soreness going down stairs. Suspect my high from a great race has masked the soreness. Biggest thing I noticed was just how tired I was each night despite having slept well. Today is Saturday and I just got back from my first workout, a masters swim, since race. Thanks for reading my race report. I’d love your feedback especially on following feet, steady riding on the bike, pacing on the run and any other tips you Race Ninjas might have for me. Ok, after some rest, time to start training for IMCdA.